The rising popularity of connected TV offers advertisers real advantages over traditional TV. These include better ROI, in-flight campaign optimization, enhance measurability and targeting, and a chance to reclaim some of the “dark time” absorbed by Netflix watching. At the VideoNuze Online Ad Summit, I had the pleasure of moderating a discussion entitled Connected TV’s Ad-Supported Future. The panel included senior executives from Hulu, Roku, Pluto TV, and Beachfront Media. I kicked the session off with a simple question: What are some of the advantages to an advertiser buying connected TV ads over ads on traditional TV? Here are some highlights from what the panelists had to say. Of cause, publishers have always worked with advertisers to identify what their crucial campaign performance parameters are. For example, the advertiser may be looking to boost website traffic, store visits, or simply increase sales. Mr. Walters says connected TV allows the publisher to measure performance against these parameters and course-correct the campaign while it is still running. He said that Beachfront Media could offer to target against 10,000 segments, allowing advertisers to reach any group they could want. However, he pointed out one problem with this degree of targeting. It can lead to a campaign that reaches too few people. Jim Keller, VP of Sales at Hulu, made the point that connected TV puts the audience in control of how they watch television. Greater control leads to higher engagement which, in turn, is a great opportunity for marketers. 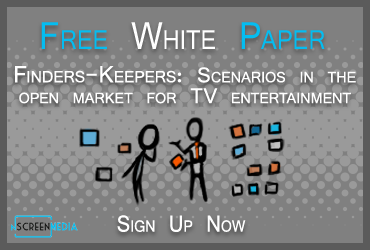 According to the latest free white paper from nScreenMedia, The Secret Life of Streamers part 2, connected TV delivers the highest engagement of all screens. During primetime, the average connected TV viewing session for premium content is 77 minutes, while the smartphone delivers only 32 minutes. Similarly, video completion rates on the connected TV are over 80% while the smartphone delivers only 51%. Rich Calacci, Chief Revenue Officer of Pluto TV, focused on a completely different aspect of the growth in the use of connected TV. Much of the viewing on the platform is dark to advertisers. His point about the dominance of companies like Netflix is well taken. I recently calculated that Netflix viewing in the US in 2017 removed between $3 and $6 billion from the television advertising market. Mr. Calacci went on to explain that television no longer reaches everybody since there are 30 million homes that don’t have pay TV anymore. An ad-supported video service on a connected TV is now the only way to reach that group in a fast, effective manner.